Enter Madrid resident and Spain blogger, Perri from Seeking the Spanish Sun! Perri is from Kent, UK, and she moved from London to Madrid in February 2017. She’s been traveling and living overseas for many years and decided that Spain is where she wants to buy a house and settle. Good choice! Check out the food map of her restaurant suggestions at the end. Take it away, Perri! This food guide to Madrid will tell you all about the best foods to try in Spain’s capital city. Some are traditional and some are modern foodie trends. Each one is a must if you want to experience the real flavour of Madrid. I’ll share my local tips on where to find these yummy foods and my favourite spots across the city. Churros con chocolate is a delicious Spanish sweet, typically eaten for breakfast. The batter is piped into hot oil and fried until golden and crispy, sprinkled with a little powdered sugar and served with a cup of thick creamy chocolate. 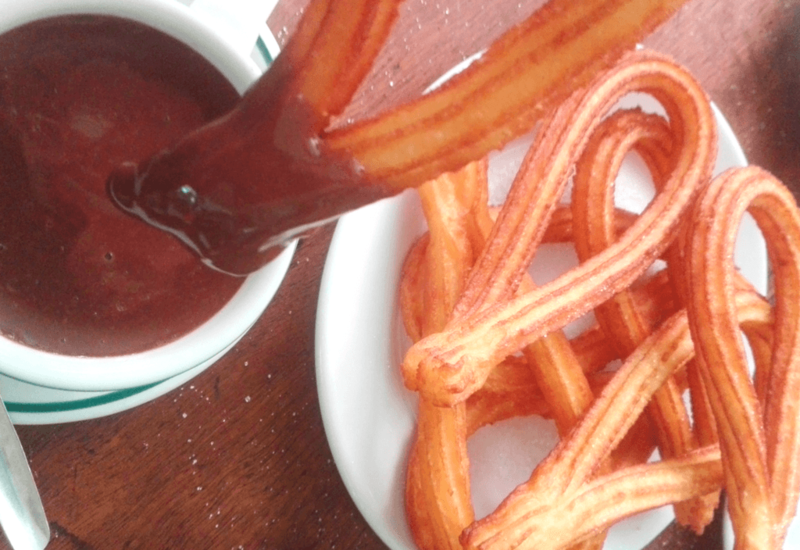 Dipping a fresh, hot churro into the chocolate is one of the best things to do in Madrid. Most Madrid café’s will serve churro’s for breakfast but once they are all sold out, that’s it, a fresh batch will not be made until the following morning. Luckily there are few speciality churrerías in Madrid that will serve churros all day long. The most famous are San Gines and Chocolateria Valor. A Spanish sandwich is called a bocadillo, a long bread baguette, sliced and stuffed with local fillings. They are usually freshly baked, prepared on premises and displayed piled high for you to select. Perfect for lunch on the go. Popular fillings are Spanish jamon, cheese or tuna salad. In Madrid, it’s also common to see calamares, deep fried squid rings or a slice of tortilla, an egg and potato omelette inside bocadillos. The best jamon bocadillo is served at Museo del Jamon and the best bocadillo de calamares (calamari sandwich) is at La Campana. 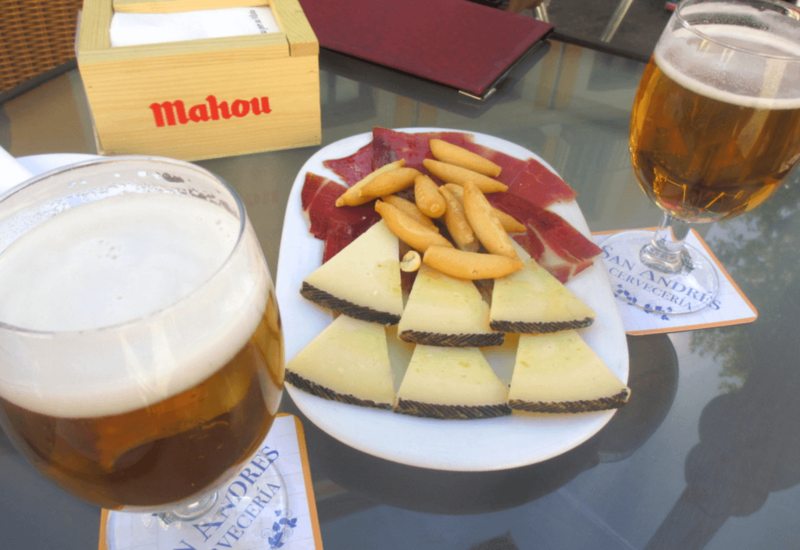 Tapas and beer, or cerveza in Spanish, go hand in hand in Madrid and most locals will eat a smaller tapas style meal for dinner. Typical tapas include padrón peppers, chorizo (sausage), prawns, tortilla, olives, jamón, cheese and patatas bravas (spicy potatoes). The servings are small and usually people will share, ordering a few dishes at a time and snacking on tapas while enjoying some drinks. The local Madrid beer is called “Mahou” and it’s the brand most served on draught across the city. Other great local drinks to have with tapas are tinto de verano, a mix of red wine and lemonade served with ice and lemon or cava, a crisp sparkling Spanish white wine. Cava Baja in La Latina is the iconic tapas street in Madrid and the best place to go for tapas bar hopping. The entire street is lined with amazing tapas bars, my favourites are Cava 17 and El Tempranillo. A chickpea stew called cocido madrileño is very a traditional dish in Madrid. It’s hearty and warming and full of local meat and vegetables. 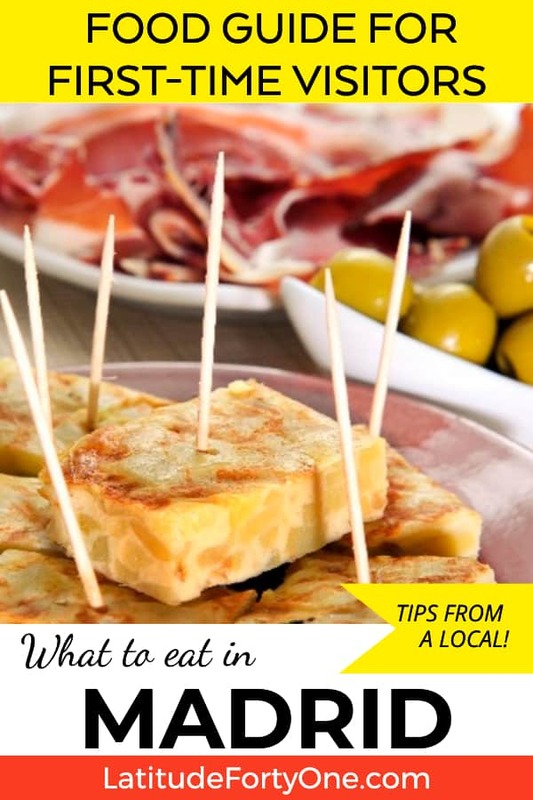 It will usually include potatoes, beans, pork meat, chorizo, carrots, and onion but recipes vary from place to place and some may add cabbage, jamón, beef, green beans or turnip. It’s traditionally served separate from the stock broth and all put together at the table as they would have done in medieval times. This dish is eaten mostly during the winter so it might not be on the menu in peak summer. The more traditional “mesón”-style restaurants will serve cocido madrileño and they are located around Plaza Mayor and Cava Baja. Posada de la Villa and Taberna de la Daniela both serve nice big portions. 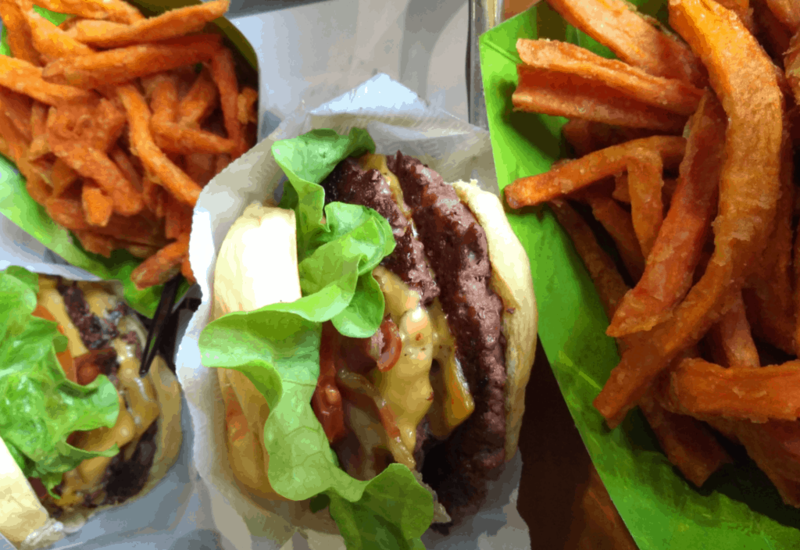 Over the last few years, lots of really good burger joints have opened in Madrid. It’s obviously not a traditional dish but I thought it was worth mentioning because they are sooooo good! Typically in Spain, burger patties are a mix of beef and pork mince but these new burger restaurants are taking inspiration from the successful chains in USA and UK and focus on using only great quality 100% beef meat. With lots of yummy modern sides like onion rings, nachos, and sweet potato fries. The top burgers in Madrid are found at The Good Burger and Goiko Grill. There is no shortage of coffee shops in Madrid. Locals enjoy a good café con leche to start their day and almost every bar and restaurant will have a decent coffee machine. The traditional Spanish cafeterias in Madrid are long counter tops with a display cabinet for the day’s fresh bread, pastries, and tapas. Locals will stop by any time of day to enjoy a drink and a snack. There are also lots of modern cafés that have a more cosy feel, free wifi and lots of yummy cakes to choose from. Catering to the more up-to-date needs of coffee drinkers and are often busy with students, young mums, and business meetings. Take-away coffee is not standard in Madrid, if it is possible to get a take-away cup they will advertise “para llevar“, if not sit inside, take your time and enjoy. My favourite cafes in Madrid are Café de la Luz and Federal Café. A bit of a waffle craze has hit Madrid. If you’ve never tried one before, a waffle is batter cooked within a hotplate. In Spain they are called gofres and usually come with chocolate sauce and sliced bananas or strawberries. A new, innovative style of serving, where the waffle is rolled up and the fillings are stuffed inside has seen some very creative stores pop up in Madrid. This new style is called “bubble waffle” and the waffle pattern is less grid like and more bubbly, soft and bendable. This simple idea, is fun and very Instagrammable, allowing small businesses to open quickly and offer these waffles to takeaway while people queue up for them down the street. The waffles can get a bit messy when they melt, so you better eat it quickly! 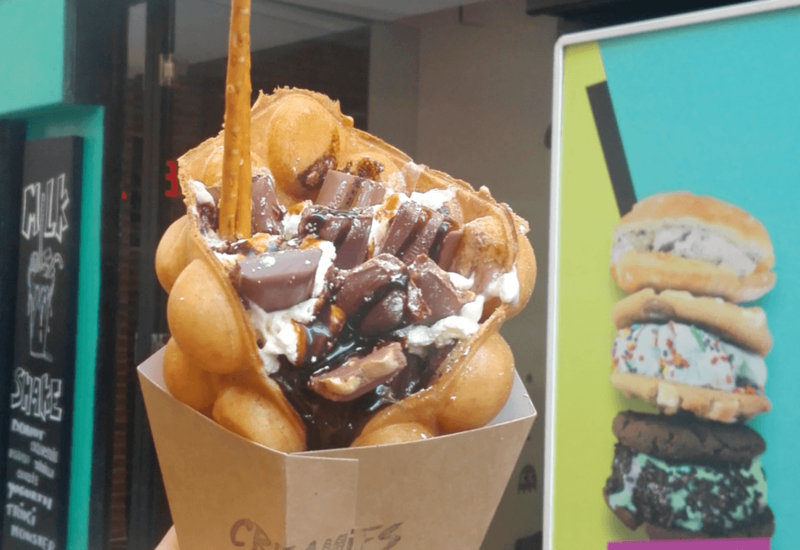 The best bubble waffle shops are Creamies and MadWaffle. 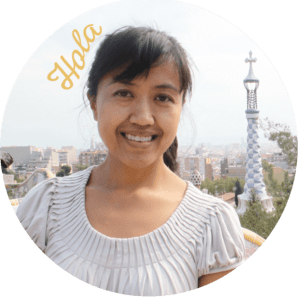 Thanks so much, Perri, for sharing your expertise on must-eat foods in Madrid! And check out Seeking the Spanish Sun if you’re visiting or moving to Spain! 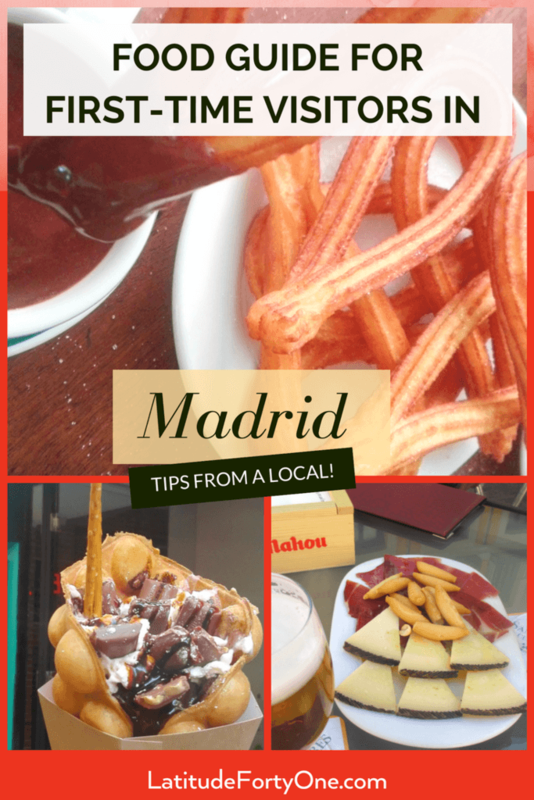 Do you have any places to eat in Madrid to add to this list?